Positivity has its benefits and it’s also totally entertaining when you watch Jim Carrey make the theory a reality in the newly released DVD Yes Man. 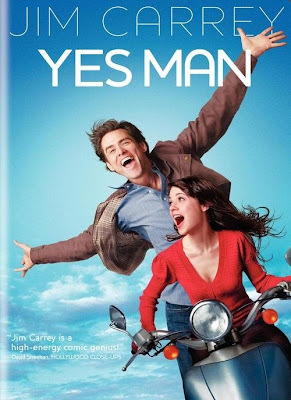 The film is based on the true story of English humorist Danny Wallace’s theory of saying yes in situations where you would normally say no, which he chronicled in a book by the same name and the theory is truly interesting and wondrous. The film, which was directed by Peyton Reed (The Break-up and Upright Citizens Brigade), wins the audience over quickly and is absolutely fun to watch as it pairs a classic wacky Jim Carrey character in Carl Allen with an onslaught of weird and unlikely scenarios that do hammer home the concept of staying positive in life and making yourself open to opportunities. The plot is a bit expected (in addition to being a bit too similar to earlier Carrey films like Liar Liar) as Carl, the tightly wound loan officer who denies everything by day living almost hermetically, accidentally encounters an old friend who opens him up to the theory with a pamphlet but the cast does a great job in making it fresh and once the action begins, Carrey falls right into place with his trademark silliness and boundless energy. Zooey Deschanel plays Allison, the off-beat artsy musician love interest who pops up to give Carrey’s character a ride and later reunites with him accidentally as he says yes to attend a show by her band “Munchausen by Proxy” (who are actually pretty good despite being a fictional band). Crazed wackiness ensues as Carrey’s character says yes to a Persian Wife finder website, guitar lessons, flying lessons, Korean lessons, and countless loans which he approves for everyone who enters and of course it all catches up with him. The film won’t be put into the great American Canon any time soon but it’s perfect for a rainy day and is one of those films you can watch repeatedly without exhausting. The extras are also fun to watch as Carrey does most of his own stunts for the film including bungee jumping off a bridge and come on, who doesn’t love the Jim Carrey outtakes?